The Mediterranean diet is known for its beneficial health effect and decreased mortality. So does Cretan cuisine. Who doesn’t want to live forever, right? In Crete, people live that way. Passing between generations (grandma to mother to daughter), the way Cretans cook their food is unique. Ingredients like pure olive oil, dairy, cooked vegetables and local herbs are widely used. 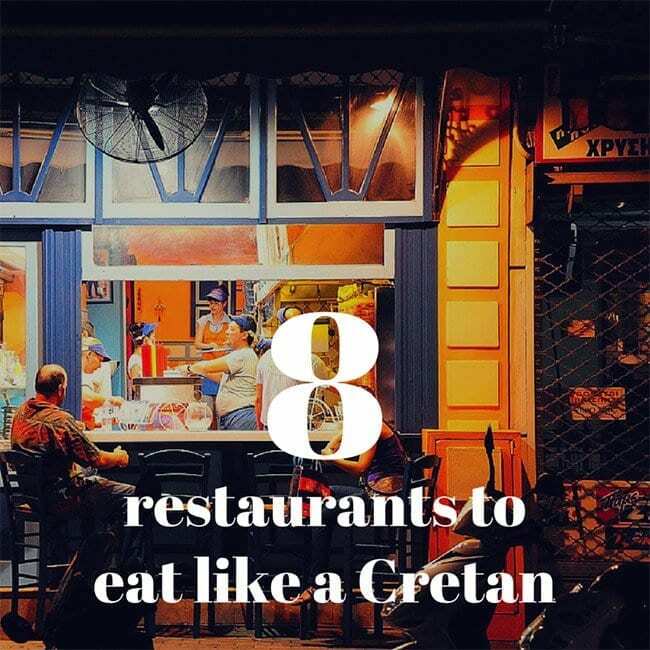 Below you will find 8 of the best Cretan restaurants that we think you should visit in order to really experience the authentic local cuisine. A small family-run organic restaurant in the heart of Archanes, only a 10-minute drive from Heraklion. All dishes are homemade and every ingredient used in their kitchen is either produced or collected by locals. Do not leave unless you try the Kritamisu, the cretan version of tiramisu. It is located in a small pedestrian street, within a lively neighborhood, right in the center of Heraklion. Great atmosphere with pleasurable greek music and reasonable prices. Peri Orekseos, like most restaurants in Crete, offers a complimentary treat with a small bottle of raki, after your meal. It is called “kerasma”. Here, they serve lava cake with ice cream. You should visit this place just for this particular treat. Probably the best restaurant in the area. In a great location, in a small alley right next to the Israeli Synagogue. A mix of Cretan and Turkish flavours with an excellent wine selection. Mezze-style dishes combined with the atmosphere of original Turkish baths. Without naked turkish men inside, of course. Do not forget to try the famous rabbit casserole (or any casserole for that matter). You will find Leventis taverna in Ano Stalos, very close to Chania. Award-winning traditional flavours like meat pie, onion pies (kalitsounia) and goat with local greens (stamnagathi). Leventis taverna uses exclusively pure virgin olive oil, so quality in cooking is guaranteed. In the Misiria area, very close to Rethymno, you will find Zisis Taverna. The restaurant, which is ideal for families, has been operating since 1972. The recipes of Grandpa Zisis and Grandma Chrysoula will satisfy even the most demanding palate. You can choose your meal from the menu or from the “shop window” display next to the kitchen. Be sure to try the cretan burgers and the apaki (fatless smoked pork fillet). It is also ISO & HACCP certified for its quality cooking and service. This restaurant is a legend in the area, having been serving the freshest fish and seafood for over 40 years. Sea bream, goatfish and lobster, plus squids, mussels and shrimps “saganaki” with cheese. You can also enjoy the unique view of the “Leper Island” Spinalonga. What makes this place a legend? The cast of “The Island” show, based on the book by Victoria Hislop, were regulars at Giorgos Taverna. Nowadays, the walls are decorated with exclusive photos of the cast and the production. If you have read the book (or watched the show), you will definitely be able to relive the unique atmosphere of the era. This is our romantic choice, ideal for couples, anniversaries, wedding proposals and special events. Here you will have the chance to dine on a floating deck, in the Chersonissos harbour, with a stunning view to the boats nearby. You should definitely order the mushroom risotto, grilled swordfish, salmon fillet and garlic bread. You can book a table online through their website. We know you will, you lovebirds. In Paleochora, we visited Veggera. The location is excellent, right next to the sandy beach. A tropical setting with traditional Cretan food, for the occasions when you look for something truly different. It is open all day long for breakfast, coffee, lunch and dinner. Try the meatballs with the tzatziki and the “dolmades” stuffed vine leaves. You should not miss the Cretan folk dance evening, with live Cretan music and professional dancers in traditional costumes, every Thursday during the summer. It’s like a cretan wedding without a bride and a groom. Tipping in Cretan restaurants is not mandatory and definitely not included. If you were satisfied with the service and the food you can tip up to 10-15 EUR. If not, you could tip nothing or something up to 5 EUR.